My hair always has a bad case of the frizzies. In my travels, I have found a product that is able to tame my mane for most of the day. 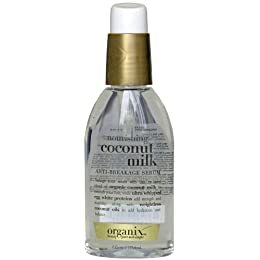 Organix Coconut Milk Serum provides a great shine and makes my hair feel great and nourished. Designed for anti-breakage, if you aren't a fan of Coconut, Organix also makes a similar product in Shea Butter. I tend to put in on right after I get out of the shower, but you can apply in when your hair is dry or right before your going to apply heat to help prevent damage.